A few Wednesdays ago (Aug 26), I took the long walking way to the grocery store. The air was smoky from forest fires raging in Washington state, but it was better than the day before. I made a westerly loop to the Bow River Pathway, just west of the Crowchild Trail bridge. I photographed many birds – swallows, ducks, hawks, warblers, etc. I even snapped a few mediocre shots of some flying gulls, which I assumed were Ring-billed gulls, since they were the only gulls I’d seen in Calgary until then. But when I looked at the fuzzy gulls on my computer screen, they were clearly not Ring-billed gulls. Exciting! Saturday (Aug 29), the smoky skies cleared. So I jet-biked to the Inglewood Bird Sanctuary to catch some bird action. On my ride back, I stopped at a few places along the Bow River (near Pearce Estate Park) to look for gulls with black eye patches. I found a few non-breeding adult Franklin’s gulls mingling with Ring-billed gulls. 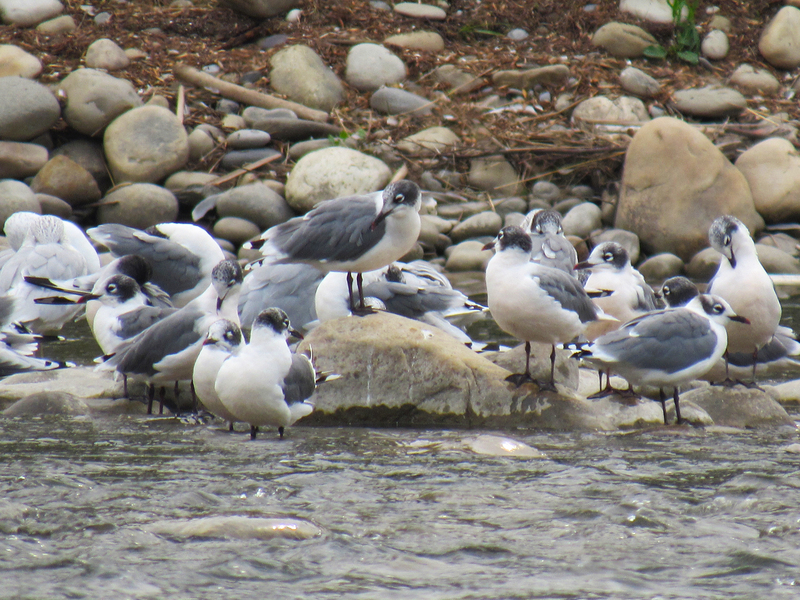 At the Harvie Passage, where the Double Crested Cormorants like to hang out, I saw some juvenile Franklin’s gulls. A third gull species made a fuzzy appearance in a few of my far-away cormorant photographs. 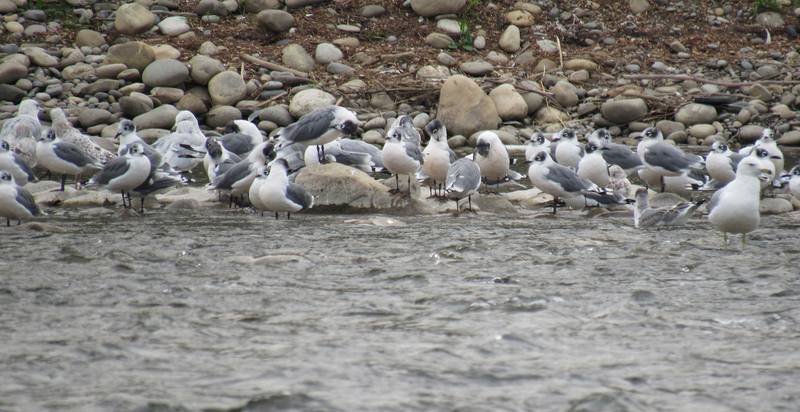 On Sunday, I journeyed to a few popular gull spots on the Bow River to figure out who they were. I have rarely found gulls so exciting! You make me feel ashamed for taking them for granted I will forever be grateful for the common seagull now! Thank you for showing me how lovely they are..even if they’re common where I live! Oo, oo, do you know what kind of species hangs out in your area? Laura (or Create Art Everyday) inspired me to notice gulls. I used to only see them when they made a ton of noise eating bread and french fries. When she told me they were her favourite bird, I started noticing them when they were quiet. In Vancouver, I mostly saw Glaucous-winged gulls. In Calgary, I mostly see Ring-billed gulls. And recently, I’ve seen these Franklin’s and some California gulls. Last year, I thought there was just one seagull! Glad my gull excitement was a bit infectious :-). I would love to see and photograph your Black headed gull! We have Heermann’s, Mew, Ring Billed, Western which is really common, California, the Herring, and the Glaucous too. There are a lot more than I ever thought there were…which I discovered through photographing them. Wow, nice variety :-). I started noticing plants and animals a lot more when I started taking my camera on walks. Thanks Jodi :-). Do you see gulls were you live? :-(. I guess you live a bit too far from a big river or the ocean. Luckily, you get lots of other awesome birds that visit your backyard. And sometimes neat toads sneak into your house :-D.
They’re beautiful! I’ve never even thought much about which kind of gull I’m seeing, but your posts have me thinking differently about that. Great shots! Thanks Laura for the compliment, and for making me notice gulls :-). I wonder if there are different species of gulls in your area as well, not just the Ring-billed gulls. I recently read that some gulls take four years to reach maturity while others take three. I was surprised that it took them so long. One of the cool things about taking pictures and drawing is that my daily scenery is no longer a beautiful blur of colours; there are all these wonderful details that change every day. Glad you are also enjoying the little bits of information I am learning about my neighborhood birds :-). I’ve definitely experienced an interesting change in focus. It is probably good to do that once in a while :-). Sometimes I stare at something for a while and suddenly something I didn’t notice pops out! That always makes me laugh. Like a well camouflaged bug on a flower. Oh, so cool! Franklin’s Gulls! I think I’ve mentioned to you before: gulls are like sparrows to me – they all look alike. I could tell the difference if I took the time to observe, but in passing, they all look the same. 😉 Love these photos! Thanks Teresa :-). I agree. 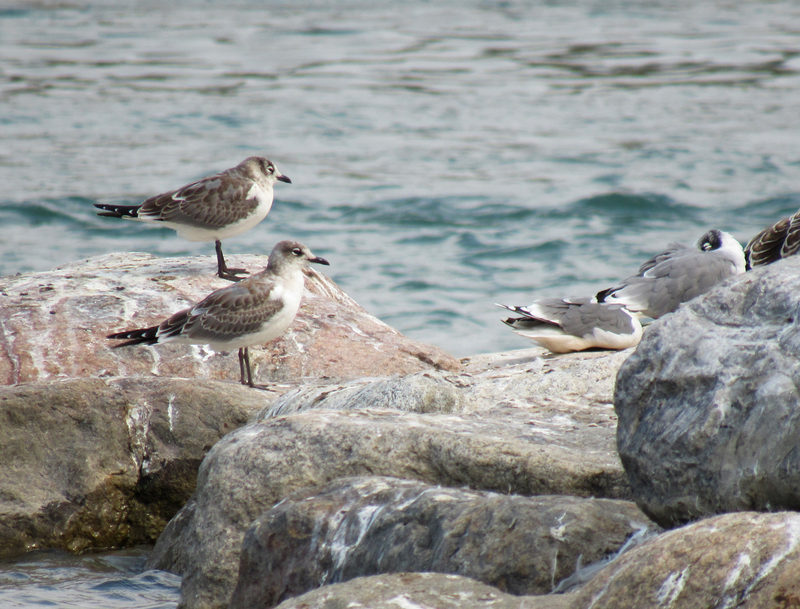 In passing, gulls are white and grey jobs mixed with mottled brown and white jobs. Sparrows, of course, are little brown jobs. I’ve recently met some new sparrows and I almost get a headache staring at their particular pattern and thinking – is that a Lincoln’s? a swamp? clay-colored? singing? But some day, some day I will just know. Even them tricky juveniles! They do look quite similar :-). Laughing Gulls are bigger (according to All About Birds) but that is hard to tell from a photo. From looking at pictures of non-breeding adults, it seems to me that the Laughing Gulls have a smaller black patch near their eyes. That is the easiest way for you and me to tell them apart :-)! Their ranges don’t overlap where we live. I think Franklin’s laugh too. I’ll have to pay attention to their sounds next time I see them. I listened to recorded Laughing gull sounds yesterday. They sound a bit like chimpanzees sometimes… to my ears anyway. Made me laugh! Beautiful photographs of beautiful subjects. Love the markings on your Franklin gulls, and love your story, finding something ‘new’ hidden in plain sight. Peace. Thanks Haunani :-). I do like the delight of finding something new hidden in an every day sight. We’ll be heading to the beach, and when we do, I’m going to try and identify some of the gulls. I see lots of familiar birds in your photos, Myriam. They must have quite wide ranges, some of these birds! I’m on the east coast US. And the beach we usually visit is also. 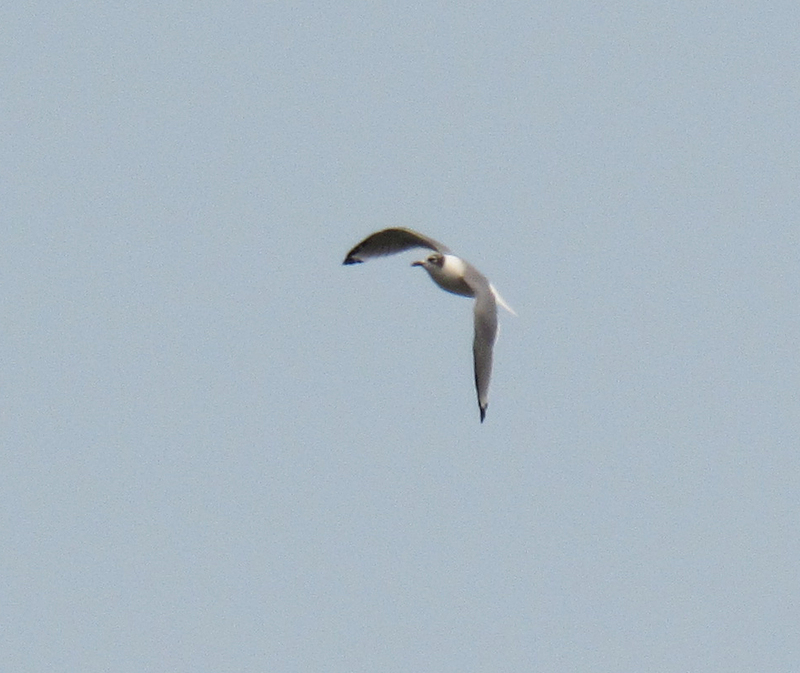 Oo, maybe you will see Laughing gulls, which look like Franklin’s gulls but summer along the US east coast. It is cool how far some birds travel. Someone recently told me that the Arctic Tern migrates from the Artic to Antartica. Have fun at the beach :-)! Thank you! I just looked both up – they look so similar! I know I have seen them, but they’re not so common as say the ring-billed gull. I’m not sure if I could tell them apart on the fly! They all look the same to me when they are way up in the sky! But if you stand close enough or can zoom in a bit with a camera, suddenly bird details appear :-).